This will be my final report as your Grand Master of the State of Texas. This year started off with the Grand Body electing me as your Grand Master in March 2015 for the ensuing year. 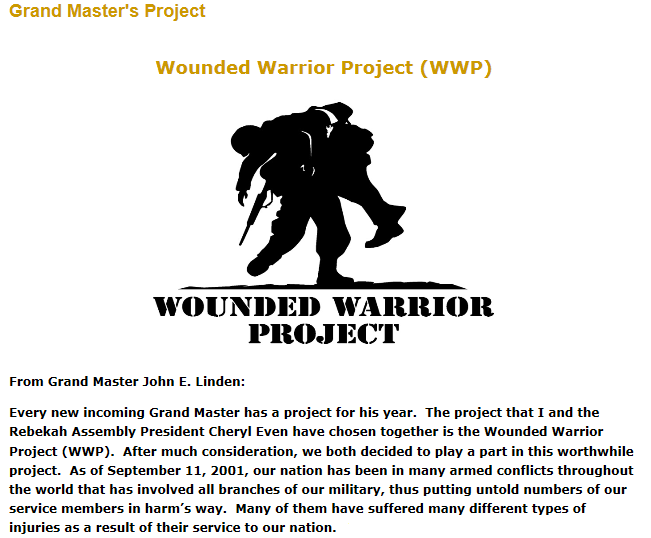 Since being elected Grand Master, the year started off at a quick pace and has continued at a fast pace. 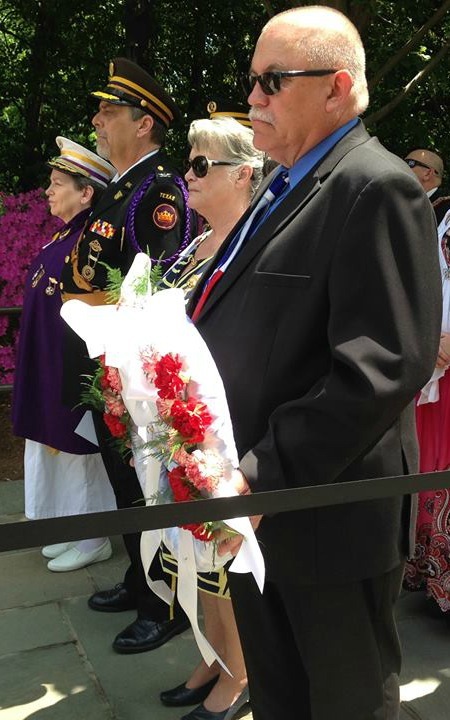 My first official trip was to Washington D.C. in May to participate in the honor of laying the wreath at the Tomb of the Unknown Soldier at Arlington National Cemetery, representing the great State of Texas. It was a great honor and one that I will remember for the rest of my life. The next major trip I took was to Harrison, AR during the first part of July to attend the Mid South Conclave. 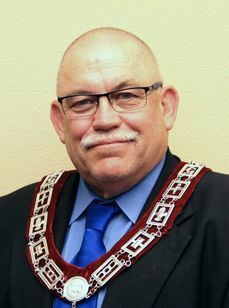 Also during the month of August, I attended my first Sovereign Grand Lodge Session which was held in Fort Worth, Texas, where Brother Danny Wood from the jurisdiction of Texas was installed as Sovereign Grand Master. 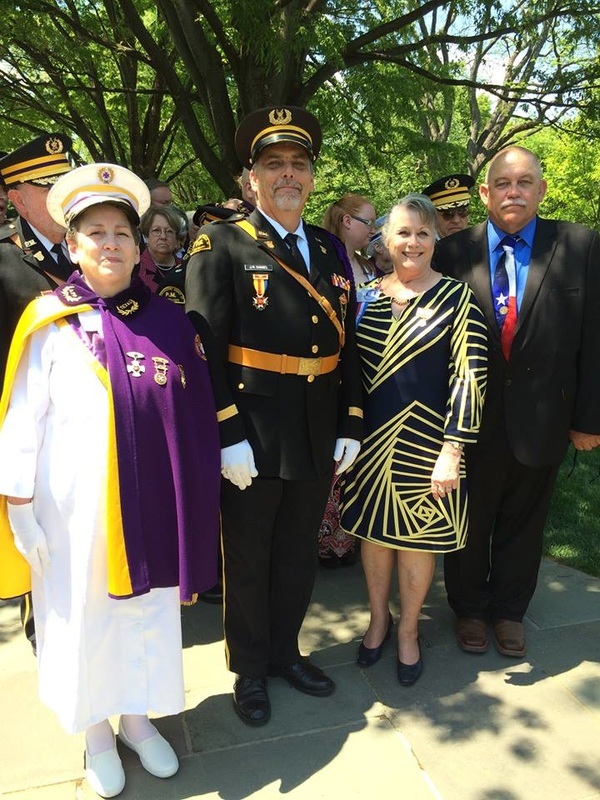 This being my first Sovereign Grand Lodge Session to attend, I, along with Peggy Idom, were given the honor of presenting the Texas flag at the opening ceremonies. In September, I attended the Pilgrimage at the Retirement Center which was re-opened in July 2015 by a vote of the Grand Body during the Grand Lodge session in March. The Retirement Center Director, Jennifer Mitchell, E. Dixon Toney, and the staff worked long hours to reopen the Home within four short months after the session. The Pilgrimage was well attended by brothers and sisters from around the state. The meal served was great and the entertainment which followed was also great. The next major event that I attended was the testimonial for Sovereign Grand Master Danny Wood which was held in Fort Worth, Texas during the first part of November. This also was my first testimonial to attend and I found it to be very enlightening and informational. I enjoyed the fellowship with brothers and sisters from different parts of the country. In December I attended the Executive Committee/Home Board Christmas party which was held at the Grand Lodge office. Grand Warden George Richards and Assembly Warden Artis McCormack did a great job in selecting the meal and the entertainment for the evening. That same weekend, I attended the Christmas Party which was held at the Retirement Center where a good meal was served. The entertainment for the party was directed by Assembly President Cheryl Even with the help of several other brothers and sisters who were in attendance. During the course of the year, I have attended all of the Executive Committee meetings along with all but one of the W. & 0. Homes Board meetings. The members of both boards have done an excellent job during the past year in taking care of different matters which have come before them during the course of the year. It was with great regret that the Executive Committee had to demise Fisherman's Lodge. Also, the Iris Lodge in Orange, Texas, turned in their charter due to a lack of members. On the other hand, the Executive Committee was able to institute the first United Youth Group in Texas which is being sponsored by the William Tell Lodge No. 27 in Tyler. I hope both the Executive Committee and the Board of Trustees will be able to continue working and moving forward during the coming year for the good of the Order as a whole. During the year, the W. & O. Homes Board hired several Administrators for the Nursing Home until Geri Callender was hired during the latter part of the year. During her short time here she has made several improvements on how the Nursing Home operates and we are starting to see how those improvements are working. If the Administrator continues with her changes, hopefully the Nursing Home will become more prosperous in the coming years. The Event Center Management Committee hired Deanna Hayes in December of 2014 as a part time employee and she was quickly promoted to Director. During the course of the year, the Director has been able to promote the Event Center to citizens and businesses in and around Corsicana which has generated more utilization of the Center and in turn more revenue. I hope the Director and her staff can continue the growth of the Event Center in order for it to become the most sought out venue in Corsicana and the surrounding area. I would like to thank Denton Odd Fellow Lodge No. 82, Ora E. Davis Rebekah Lodge No. 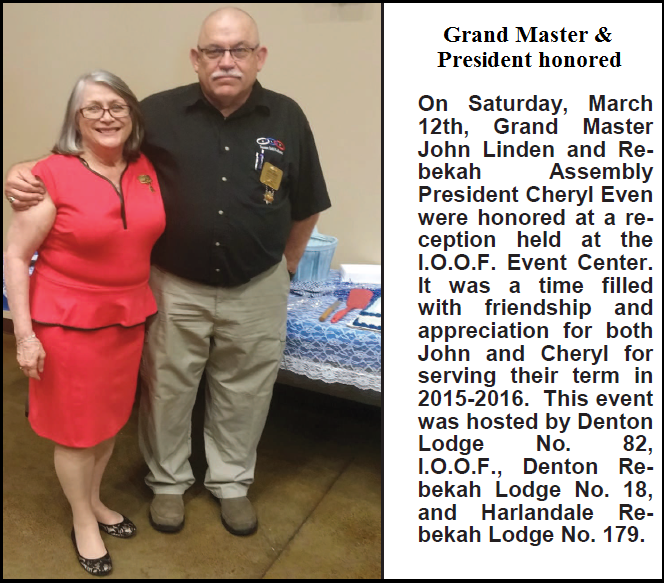 241, and Denton Rebekah Lodge No. 18 for all of their support and help during my year as Grand Master. I also want to thank Assembly President Cheryl Even for her help and support over the last three years. And finally, to my wife and family, for all their love, support, and help they have given me during my three years of going through the state chairs. 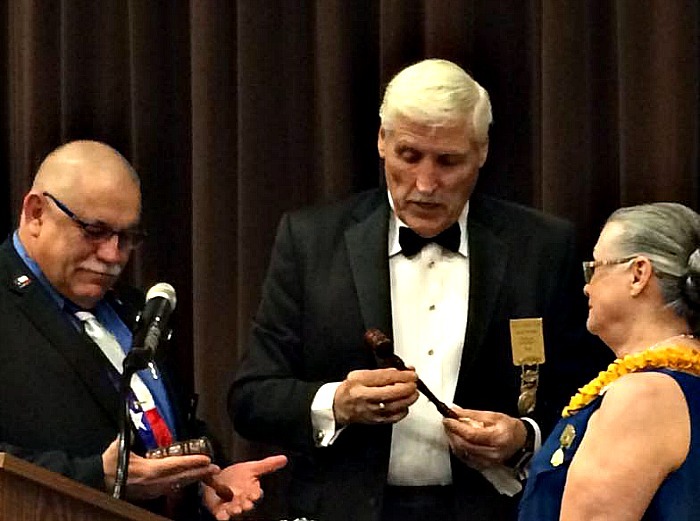 Our PGM John Linden and PPRA Cheryl Even receiving gavels from our Sovereign Grand Master Danny Woods that he had made himself.